They say the eyes are the window to the soul—and yet as important as eyesight is, many people simply don’t pay as much attention to their vision as they should. In fact, more than 20 million Americans suffer from severe vision loss, according to the American Academy of Ophthalmology. But with a few simple strategies, you can take care of your eyes and help protect your vision into your 50s, 60s and beyond. Where to start? As with all other areas of your health, regular visits to your eye doctor and knowing your family history are the first steps. So check in with your doctor about how frequently you should have an eye exam. The American Academy of Ophthalmology recommends healthy adults get an exam every two years starting at age 18, and annually for adults over the age of 60. And, of course, avoiding smoking (or quitting if you do smoke) is a smart strategy, because smoking impacts oxygen flow and can increase the risk of certain conditions, like cataracts. Here are five more tips to follow to protect your peepers. See your eye doctor. If you find yourself suffering eye problems, such as blurry vision, headaches or sensitivity to light, or have a family history of diseases that put you at risk for eye problems, which includes diabetes or high blood pressure, you’ll need to visit with your eye doctor more often than mentioned above. Check with your doctor to see what he or she recommends based on your personal health history. Feed your eyes. Fuel your eyes with a nutrient-rich diet that includes lutein and zeaxanthin, two antioxidants found in leafy greens (kale and spinach), broccoli, green beans and green bell peppers. Another food to consider reeling in: fatty fish, such as salmon and sardines, which contain omega-3 fats. Omega-3s are an important structural lipid in the retina. They help support proper function and health of your eyes as you age. Omega-3s help maintain healthy tears and a healthy retina. My take: We know how good omega-3s are for overall health, so I think it’s worth including fatty fish in a nutritious diet. 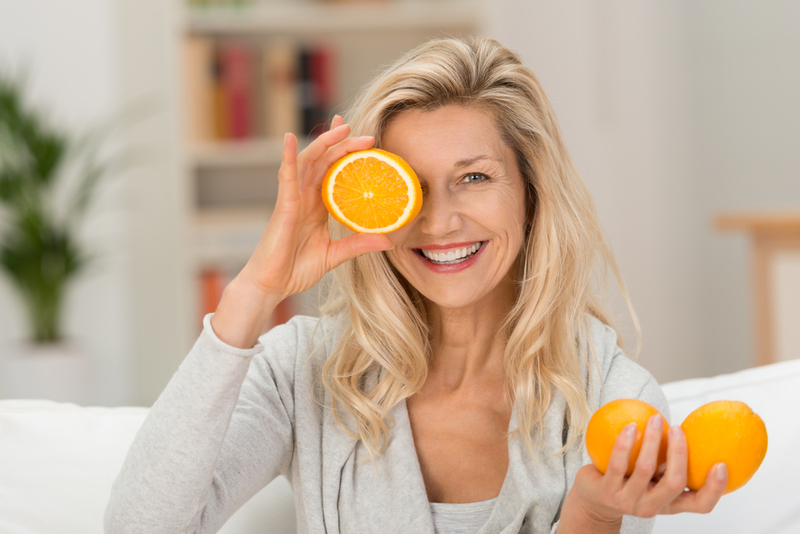 And you should talk to you doctor about taking a supplement, like Ocuvite Adult 50+ eye vitamins, which can help replenish the key nutrients to help keep your eyes healthy. It’s specifically formulated with key ingredients like lutein, zeaxanthin and omega-3s. Exercise regularly. Physical activity is as beneficial for your eyes as it is for the rest of your body. Studies show that exercise, which enhances overall circulation, helps reduce the risk for eye conditions including glaucoma because it supplies the eye with oxygen and vital nutrients crucial to protecting the delicate cells that make up the eye. It also helps prevent weight gain, which puts you at risk for diseases that can affect your vision, including diabetes and hypertension. Aim for at least 30 minutes per day of whatever activities you enjoy, whether it’s walking, swimming, bike riding or taking a fitness class. Protect your peepers. You now have good reason to go shopping for a pair of stylish shades: Reducing exposure to harmful UV-A and UV-B rays not only helps cut the risk of cataracts and retinal damage but it can also protect against skin cancer and wrinkles around the eye. When purchasing sunglasses, be sure to look for 100 percent UV protection. It should say “UV absorption up to 400 nm” or “Meets ANSI UV Requirements.” And don’t stop at shades! If you’re playing sports, working out in the yard or cleaning the house, you may want to consider investing in a pair of ANSI-protective eyewear. A hat can offer additional protection for your eyes and face if you buy one with a big enough brim. Use the 20-20-20 trick. We’re all glued to our computer screens, tablets and smartphones, whether we’re reading emails, checking social media or texting. All this screen time is draining our eyes—it’s time to take a break. In fact, every 20 minutes, you should be giving your eyes a rest. There’s an easy-to-remember guideline eye experts recommend: 20-20-20. Every 20 minutes while working in front of a screen, take 20 seconds to stare off at an object 20 feet away. For more eye-healthy tips, click here. The experts quoted and the studies referenced in this piece are not affiliated with Bausch + Lomb. Ocuvite is a trademark of Bausch + Lomb incorporated or its affiliates.